On Dec 4, 2012, President François Hollande inaugurated the Louvre-Lens, a new incarnation of the world renowned Louvre in the town of Lens in Northern France. This museum is intended to be a forum for showcasing the cultural riches of France beyond the metropolitan area of Paris, and reaffirming a cultural national identity for the whole of France rather than just the urban centre. 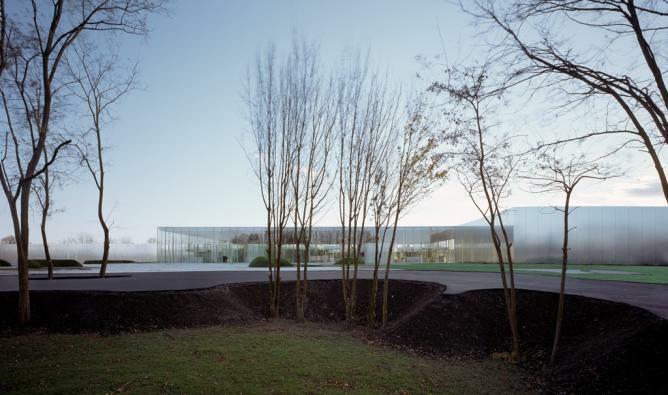 Co – auteurs du Musée du Louvre-Lens : © SANAA / Kazuyo Sejima et Ryue Nishizawa – IMREY CULBERT / Celia Imrey et Tim Culbert – MOSBACH PAYSAGISTE / Catherine Mosbach. Photographie © Hisao Suzuki. The town of Lens lies in the cultural vital but little celebrated area of Nord-Pas de Calais in Northern France. What fame it has is derived from its once vibrant coal mining industry, which is now severely depressed, and its claim to having the tallest slag heaps in Europe. This largely working class town has now been graced with an outpost of possibly the most prestigious museum in the world, Paris’ Louvre, in an unprecedented act of cultural benefaction from the capital to the provinces. The geographic proximity of Nord-Pas de Calais to France’s northern neighbours, Belgium and the Netherlands, and to the channel tunnel to Great Britain, mean that it is a much traversed thoroughfare between several great capitals of European culture. The addition of the Louvre-Lens, it is imagined, will elevate it from a place of transit to a tourist destination in its own right. This strategic location is hoped to make the museum a success and be a much needed catalyst for the culture of the region. The idea for another outpost of the Louvre was conceived in 2003 and was inspired by the original mission of the museum itself, to serve the artistic and cultural needs of the entire nation, not just the capital. The Louvre has been the home of French art and culture for several centuries and has been at the centre of many of the most tumultuous political and social upheavals in the country. It is thus an integral part of France’s national identity and Louvre-Lens is an attempt to reaffirm that, and to proclaim that culture lives throughout France, and not just in its capital. Lens was chosen as the site of this new museum after the Minister of Culture put out a tender for sites throughout France, and Nord-Pas de Calais responded. Once Lens was decided upon, 120 candidates from around the world participated in an architectural design competition to win the commission to design the Louvre-Lens. The winner of this international competition was Japanese architect SANAA, who offered a decidedly contemporary building of glass and light that was in harmony with the rural landscape of the site. This low lying, luminous building echoes some of the motifs of the original Louvre in subtle but effective ways, whilst creating a contemporary palace for the ancient artefacts of the museum. It is built around a central pavilion, with wings, as is the Parisian palace, but its long, horizontal shape stretches into the surrounding landscape unobtrusively. The collection of the Louvre-Lens will be a unique selection from the Paris Louvre which will be updated regularly, fulfilling director Henri Loyrette’s vision of the Lens incarnation becoming another wing of the Louvre, rather than an outpost. Unlike the categorisations of the original Louvre, the Louvre-Lens displays its artworks and artefacts chronologically, along the immense length of the ‘Galerie du Temps’ which forms the backbone of the museums. This brings to life the dream of the poet Charles Péguy, that the Louvre should display the ‘long and visible progression of humanity’. Works by Botticelli, Raphael, Rubens, Rembrandt and Poussin will form the backbone of the first collection in the Louvre-Lens alongside 200 more exhibits. These include 25 works from the Louvre’s Near Eastern Antiquities collection, 21 from the Egyptian antiquities, 31 from the Greek, Etruscan and Roman Antiquities, 37 from the Islamic Art department, 31 from the Decorative Arts department and 30 from Paintings and 30 works from the Sculptures. From the opening of the museum, the greatest masterpieces and the greatest artists at the Louvre will be exhibited at Lens. Among the jewels to be exhibited are the emblem of the romantic revolutionary spirit of France La Liberté guidant le peuple by Delacroix, the Virgin and Infant of Botticelli, Saint Sebastian by Pérugin, the famous Portrait of Baldassare Castiglione (writer and diplomat of Raphael), a Tombstone of André Blondel de Rocquencourt by Jean Goujon, the landscape Orpheus and Eurydice by Poussin, Saint Mathew and the Angel by Rembrandt, La Madeleine à la Veilleuse by La Tour, Landscape with Paris et Oenone by Claude Lorrain, Mariana Waldstein by Goya, Louis-François Bertin by Ingres, and many, many more. The exhibition The Europe of Rubens which runs from 22 May to 23 September 2013, will be the first international exhibition at the Louvre-Lens and aims to shed light on Rubens’ life and work through 170 works by the artist, his models and by some of his contemporaries, such as Van Dyck and Bernini, which have been transported to Lens from the Louvre’s collections in Paris, and from over 50 leading European and American museums. Reflecting the European artistic culture that mattered to Rubens, the exhibition includes paintings, drawings, sculptures and decorative arts. It aims to reproduce the dynamism of Rubens’ creative output and convey the spectacular nature of his inspiration. It also offers a few intimate moments, revealing a more personal side to Rubens. The Culture Trip showcases the best of art, culture and travel for every country in the world. Have a look at our France or Europe sections to find out more or become involved.